In the “bloody days”, as Thomas Wyatt called them, of May 1536, not only was a queen executed, but also five courtiers. If we believe that Queen Anne Boleyn was innocent of all charges then these five men were innocent too and deserve to be remembered just as we remember Anne. Five families were rocked by the executions that day. These men were brothers, sons, friends, royal servants…some were fathers. They were real people and they died because their work had brought them close to the crown. Their loyal service to the king had brought them close to the queen and that was used against them. 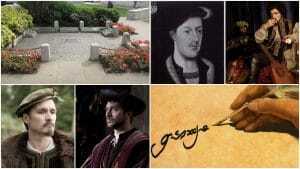 George Boleyn, Lord Rochford – Brother of Queen Anne Boleyn and a gifted poet and diplomat, and a friend of the king. Find out more about him in our George Boleyn category of posts, in the George Boleyn Interviews playlist on YouTube or in George Boleyn: Tudor Poet, Courtier and Diplomat by Clare Cherry and Claire Ridgway. Sir Henry Norris – Henry VIII’s friend and groom of the stool, and a widower who was courting Anne Boleyn’s cousin. Click here to read more about him. Sir Francis Weston – A gentleman of the privy chamber, a man who was made Knight of the Bath in 1533 and a royal favourite who was “daintily nourished under the King’s wing”. Click here to read more about him. William Brereton – A groom of the privy chamber, the son of a leading landowning Cheshire family and a man described by historian Eric Ives as “the dominant royal servant in Cheshire and north Wales”. Click here to read more about him. Mark Smeaton – A court musician from a humble background, a groom of the privy chamber and a man described as “wholly supported and clothed” by the king. Click here to read more about him. Timely reminder, Clare and a very nice piece to camera, for which thanks. These five, these unlucky five courtiers, do sometimes seem a bit lost in history’s seldom read footnote, don’t they? F.i. by now they may have acquired a sobriquet by which they would become better known – don’t know what but something like …”The Innocent Five” or “Wyatt’s Men”. One small question I have is, would Anne have known of their execution, because it does bring an end to speculation about leniency. Sad day. R.I.P. gentlemen. So Henry had her moved to a different part of the tower so she could see their executions. Henry was positively a very sick, evil person. I enjoyed the video very much and as Clare states there was never any evidence that these men were anything other than harmless courtiers, there was no evidence of sexual deviancy or shady background dealings, they were just normal men who tried their best to serve their King and were caught up tragically in the plot to bring down the queen and paid for it with their lives. I love Wyatt’s poem which gives us a snapshot of how these men were perceived by others. Wyatt clearly had high esteem for both George Boleyn and Henry Norris. He acknowledged Boleyn was “so proud” but had “great wit”. He was certainly not the buffoon that some authors and historians portray him as. Wyatt had the deepest respect for Norris it seems, who brought tears to his eyes as he reflected on the great “hap”, or “happiness/fortune” I assume, that Norris brought to others. Powerful poem.